Background. Interacting species sometimes impose reciprocal natural selection on each other. This process of reciprocal evolutionary change driven by natural selection is called coevolution. It shapes interactions between pairs of species, small groups of species, and large webs of species. It also affects how species radiate into groups of descendent species. As the number of potentially coevolving species increases, so does the number of ways in which coevolution can shape an interaction. In the early years of the study of coevolution, mathematical theory and empirical studies often analyzed coevolution of a single population of one species interacting with a single population of another species. Real species, though, are often collections of populations distributed across different environments. Species do not coevolve; local populations coevolve and what we perceived at the species level is the sum of those local coevolutionary processes. The geographic mosaic theory of coevolution was developed as a framework for envisioning the coevolutionary process in real populations and species. It has been an attempt to incorporate the minimum components of population biology needed for an ecologically and evolutionarily realistic theory of coevolution and evolving interactions in general. See the books listed on the Home page for detailed summarizes of geographic mosaic theory, coevolutionary biology in general, and, even more generally, the relentlessness of evolutionary change. The hypothesis: From these assumptions, geographic mosaic theory argues that coevolution proceeds by natural selection acting on three sources of variation that affect interactions among species. These three sources of variation can be formally partitioned as genotype by genotype by environment interactions (GxGxE). Geographic selection mosaics: The structure of natural selection on interactions differs among environments (e.g., high vs. low temperatures, high vs. low nutrient conditions; a surrounding species web that is species-rich vs. species poor). This variation occurs because genes are expressed in different ways in different environments (GxE interactions) and how one species affects the evolutionary fitness of another species depends upon the environment in which the interaction occurs. For example, an interaction may be antagonistic in one environment and mutualistic in another environment; or it may be antagonistic in all environments but selection may favor different traits in different environments). Coevolutionary hotspots: The intensity of reciprocal selection differs among environments. Interactions are subject to reciprocal selection only within some local communities. 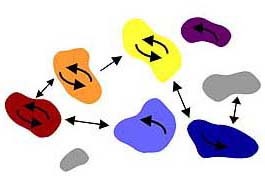 These coevolutionary hotspots are embedded in a broader matrix of coevolutionary coldspots, where local selection is non-reciprocal or where only one of the participants occurs. For example, an interaction may be mutualistic or antagonistic in some environments (coevolutionary hotspots) but commensalistic in other environments (coevolutionary coldspots). Trait remixing: The overall genetic structure of coevolving species continually changes through new mutations, genomic alterations, gene flow among populations, differential random genetic drift among populations, and extinction of local populations that differ in the combinations of coevolving traits they harbor. New genetic material on which natural selection can act can result from simple genetic mutations, chromosomal rearrangements, hybridization between populations, or whole genome duplications (polypoloidy). These processes contribute to the shifting geographic mosaic of coevolution by continually altering the spatial distributions of potentially coevolving genes and traits. The combination of these processes continually changes the distribution of genotypes within any local population and the distribution of genotypes among populations. NOTE: Some descriptions of geographic mosaic theory collapse this “trait remixing” part of geographic mosaic theory to gene flow. That is an incorrect characterization. The point of trait remixing is that through a combination of genetic, genomic, and ecological processes, the available distribution of coevolving traits on which natural selection can act continues to change over time within and among populations. In studies of coevolution, a GxGxE interaction can be viewed either in the most formal way at the gene or genotype level (i.e., how selection acts on the same gene or genotype in across contrasting environments), or it can be viewed more generally at the level of how natural selection acts on two or more interacting species across many contrasting environments. Implications of this view of coevolution: Geographic mosaic theory implies that coevolution is a genetic and ecological process that relentlessly reshapes interactions among species. The structure of selection, the intensity of reciprocal selection, and the distribution of genetically based traits available to natural selection continually change over time. Understanding how these components of the coevolutionary process interact is becoming increasingly important as climate change, fragmentation of environments, and spread of invasive species are changing ecosystems worldwide. How we study coevolution: Examples of our field studies are described under Research Details. Briefly, we use a combination of mathematical models, laboratory studies, and field studies of natural populations to study how species coevolve in contrasting ecosystems over large geographic scales. We have studied the geographic mosaic of coevolution in interactions that are antagonistic to different degrees in all environments, others that are mutualistic in all environments, and yet others that are mutualistic in some environments but antagonistic or commensalistic in others. As regional and global environments change, the ecological outcomes of those interactions can also change. We have studied those effects both in the laboratory and in the field. Over the years, we have used interactions as different as those between plants and their herbivores, pollinators, and frugivores, mycorrhizal fungi and conifers, and bacteria and viruses to explore how coevolution proceeds in different forms of interaction and under different environmental conditions. All our work is directed toward understanding the links among microevolutionary processes (evolutionary dynamics within local populations), mesoevolutionary processes (geographic mosaics of evolving and coevolving species) and macroevolutionary patterns (the patterns observed among diversifying lineages).